You see, I come from a good family in Magdala. Magdala is a wealthy city on the Sea of Galilee, just south of Capernaum. My family made a lot of money in the fishing industry in Magdala. While I was growing up I lacked nothing. But I was not happy. I was sick. I would sit around the house moping and complaining and make everyone miserable. I was so distraught. Often, I was so upset that I pulled out my own hair. Sometimes I would be so excited that people couldn’t stop me from talking. I ran up all sorts of bills in the market place which my parents had to pay. I was always cooking up some mad scheme or other. I would rant and rave at the slightest provocation. From time to time I would become ill and stay in bed for weeks on end. I knew something was terribly wrong and nothing seemed to ease my anxieties. I was a prisoner inside my own mind. Then I met Jesus. He was teaching outside of the synagogue. I stood back in the crowd and listened as he spoke about a new world which God intended to create. It would be a world where the sick are healed and prisoners are set free. I wanted to taste this freedom which Jesus spoke about. I wanted to ask him so many questions. But the crowd pressed in upon him demanding that he tell them more and I was pushed farther away from him. In despair, I turned to leave and then He called my name, “Mary”. Above the shouts of the crowd, I heard it as plain as day and then again, “Mary”. The crowd hushed and once again, Jesus called my name, “Mary”. I turned around and looked into his face and I knew that I could not turn away from his call. He wanted me. “Rabbi”, I said, because I knew that he would be my teacher. In the weeks that followed Jesus taught me many things. Day by day he drove away the demons that haunted me. Jesus healed me, he set me free. and I followed him. I used the money that I received from my family to help to provide for the needs of his followers. There were other women who helped with the expenses like Joanna, Martha and Susanna. We travelled from town to town as he proclaimed God’s love and mercy to all. Jesus healed so many people. What days those were. If only we hadn’t gone to Jerusalem. We warned him not to go, but each day he spoke about what lay ahead of him. Even the men were beginning to doubt the wisdom of going to Jerusalem. But Jesus just became more and more insistent that we travel to Jerusalem. If only Jesus had not become so popular with the people. If only he had kept a low profile. But it was impossible. The people of Jerusalem greeted him with such enthusiasm that the religious leaders had to take notice. And then, there was that awful scene in the Temple where Jesus lost his temper. Soon even the Romans would not be able to ignore his presence. There was nothing we could do but stand by him. We stood at his side as he preached against the priests and the elders. We drew our courage from one another. Joanna new the city well and her connections in Herod’s court gave her the confidence to follow Jesus. Salome’s two sons were committed to Jesus and her presence helped us to bear up. The other Mary was my solid companion. We stood side by side on that horrible day after they had arrested Jesus. We stood together in the crowd outside of the cells and waited. We women waited and eventually Jesus was led out in chains. We women walked in procession behind him. We followed him through the gates of the city. The same gates threw which he had entered triumphantly just a few days before. But as we left the city the crowd jeered. On and on up the hill we went. We women from Galilee and Jerusalem walking and weeping together. Jesus staggered on ahead of us. I do not remember them nailing him to the cross. I could not bear to watch. I buried my head in Salome’s breast and wept. Salome stirred me from my own grief and pointed to Mary. I had been so caught up in my own pain that I had not noticed that she was with us. She stared up at her son and there were no tears just a terrible mask of horror. We tried to take her away, but she would not be moved. So, we stood by her and watched as life slipped away from her son. My beloved Jesus. Finally, before dusk he died and they took down his body. Joseph and Nicodemus helped us wrap his body in cloth. The Sabbath was approaching and so we laid him in a nearby tomb. There was no time to anoint his body before sunset so Joseph and Nicodemus sealed the entrance of the tomb with a stone. The others left because it was getting dark. But Mary and I stayed. We just sat there staring at the tomb. Eventually, stirred by the cold, we returned to the city. I do not remember much about the next day. It passed in a blur. Joanna and Susanna prepared the spices and ointments which Nicodemus had brought. I woke very early on Sunday morning before the sun came up. While it was still dark, I made my way back to the tomb. In the dim light, I could scarcely make out that the stone had been rolled away from the entrance to the tomb. I ran back to the city and told Peter and one of the others that they had taken Jesus out of the tomb and that I did not know where they had laid him. They ran back ahead of me and found the tomb empty. Then they went back to the city. I could not tear myself away from the tomb. Slowly I gathered up the courage to look inside and there I saw two angels in white sitting where the body of Jesus had been lying. They asked me why I was weeping and I explained that they had taken my beloved Jesus away and I did not know where they had laid him. When I turned around I saw a man whom I assumed must be the gardener. He too asked me why I was crying. I thought perhaps he might know where the body was. So, I pulled myself together and I said, “If you have carried Jesus away, tell me where you have laid him, and I will go to him”. He said to me, “Mary”. All at once I knew. He called my name, and I knew. I heard his voice and I knew. And just like before, I turned toward him and I cried, “Rabbi!”. I wanted to hold him forever. But gently he disentangled himself. “Don’t hold on to me, you must let go.” It was then that I saw his wounds. He sent me back to tell the others. He told me to tell them that he was not dead. So, I went back to the others and I told them that I had seen Jesus and I told them what Jesus told me. Not many believed me. They said we were hysterical. But Jesus appeared many times before we could let him go. Jesus told us to wait in Jerusalem and he promised that we would be blessed with the gifts of the Holy Spirit. We remained in Jerusalem. It was a difficult time. The men did not like it when we women spoke of our visions of Jesus. They tried to keep us silent. They did not want us speaking in public. They thought that we should leave the telling of our story to them. They saw themselves as more effective messengers. But to hear them tell it we women weren’t even there. I was so caught up in my own grief that I could not summon up the courage to confront the men. I continued to support them but most days I just missed my beloved Jesus. I wondered if the promised day would ever arrive. I wondered about the day when the sick would be healed and the prisoners would be set free. And then on that glorious Pentecost, everything changed. We were all together. Mary the mother of Jesus, Mary and Martha of Bethany, Susanna, Joanna, Salome, we women who had followed Jesus, we women who had stood by Jesus, we women who had witnessed Jesus resurrection, we women who had witnessed his ascension, we women and certain men were all together when it happened. Suddenly from heaven there came a sound like the rush of a violent wind, and it filled the entire house where were sitting. Divided tongues, as of fire, appeared among us and a tongue rested on each of us. All of us were filled with the Spirit and we began to speak, as the Spirit gave us the abilities. People were stunned and bewildered because each one heard us speaking their language. They knew that we were Galileans and they could not understand how they could understand exactly what we meant. People from all over the Empire and beyond, heard us speak their language. We spoke to them about God’s deeds of power and all of them were amazed and perplexed. They thought we were drunk. But Peter raised his voice and told them that we were not drunk. Indeed, it was only nine o’clock in the morning. This was God’s doing. It was as if the words of the prophet were being fulfilled in us. For God had poured out God’s Spirit upon all flesh, and our sons and our daughters shall prophesy and the young people shall see visions, and the old people shall dream dreams. It is just as Jesus told me, the day is surely coming when the prisoners will be released and the oppressed will go free. I cannot tell you how much changed because of that day. We received the gifts of the Spirit. We received the power of the Spirit. And on that day, I began to understand that I was called by God to tell all of what I had seen and heard. Nothing was ever the same again. No one could shut me up. Oh, they tried. Peter tried so very hard to keep me silent. Peter knew that Jesus loved me more than any other woman, but he was unable to accept the fact that Jesus spoke to me in ways that he never spoke to others. The men seemed ashamed of Jesus’ relationships with women. But we could not be silenced. After all, I was a sick woman in need of healing and I was touched by Jesus, healed and set free. Jesus made me whole and I grew in love and devotion to Jesus. So much so that Jesus chose me to be the apostle to the apostles. Jesus sent me. Yet the very church that I helped to established made me the patron saint of cosmetics and hairdressing. I may be a sinner. But I am not a prostitute. I am not a whore. I am not an adulterer. I am Mary of Magdala. I am the apostle to the apostles. I too am baptized by the Holy Spirit. I received the power of the Holy Spirit. I am called to proclaim the reign of God. The Good News that I bring to you today is that there is no longer Jew or Greek, there is no longer enslaved or free, there is no longer male and female; for all of you are ONE in Christ Jesus. This oneness is the vision that emerged from our grief and despair at losing our beloved Jesus to the violence that surrounded us. What visions will emerge out of your grief and despair at the violence in which your world is imprisoned? Dream dreams. Let the LOVE that is God set your minds on fire! 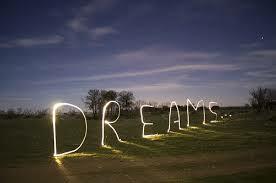 Dream dreams. Let the LOVE that is God inspire you! Dream Dreams. Let the LOVE that is God empower you! Dream Dreams. Let the LOVE that is God speak in, with, and through you! Dream Dreams. Let the LOVE that is God work in, with, and through you to change the world. Dream let visions of justice and peace come to birth in, with, through, and beyond you. This entry was posted in Evolutionary Christianity, Home, Progressive Theology, SERMONS, STORIES and tagged emergent theology, feminist Pentecost sermon, Lutheran sermon Pentecost Sunday, Mary of Magdala, progressive christian sermon, progressive Christian sermon 2:1-21, progressive Christian sermon Pentecost Sunday, progressive christian spirituality, progressive theology, spirituality, St Mary Magdalene by Rev. Dawn Hutchings. Bookmark the permalink.